The part includes the gene coding for the Methanocaldococcus jannaschii synthetase mutated to charge the orthogonal tRNA (also in the part) with the non-canonical amino acid o-nitrobenzyl tyrosine (ONBY) along with the proper promoters and terminator. This part encodes for the incorporation of ONBY during translation at AUG amber stop codons in a cell with Release Factor 1 (RF1) knocked out such as "Amberless" E. coli or "RF0" E. coli. This part was used by the UT Austin 2014 iGEM team in their ncAA kit project. 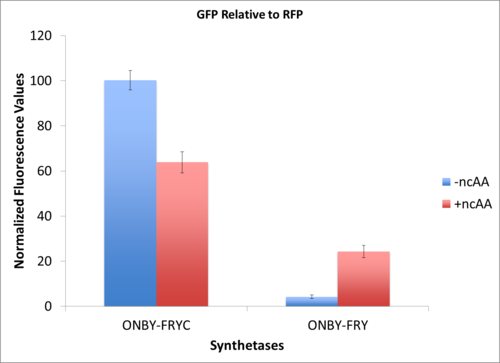 In this work they demonstrated that while ONBY itself is slightly toxic to the cells, the synthetase/tRNA pair acted with good fidelity at incorporating only ONBY. Additionally, this part was also used in the UT Austin 2014 iGEM Photocage project, where the part successfully incorporated ONBY within T7 RNA polymerase (RNAP), yielding a light-activated T7 RNAP.